Why should you bike to work? For one, it’s good for the environment. Bikes are zero emission, and swapping four wheels for two even just once a week can make a difference in the fight for cleaner air. Plus, research shows that bike commuters tend to enjoy better health and are generally less stressed than other commuters. So for the sake of clean air and good health, give bike commuting a try — and there’s no better time to do it than on Bike to Work Day, Thursday, May 18. 1. You’ll be in good company. If you’re nervous about biking to work by yourself, this is the day to do it. 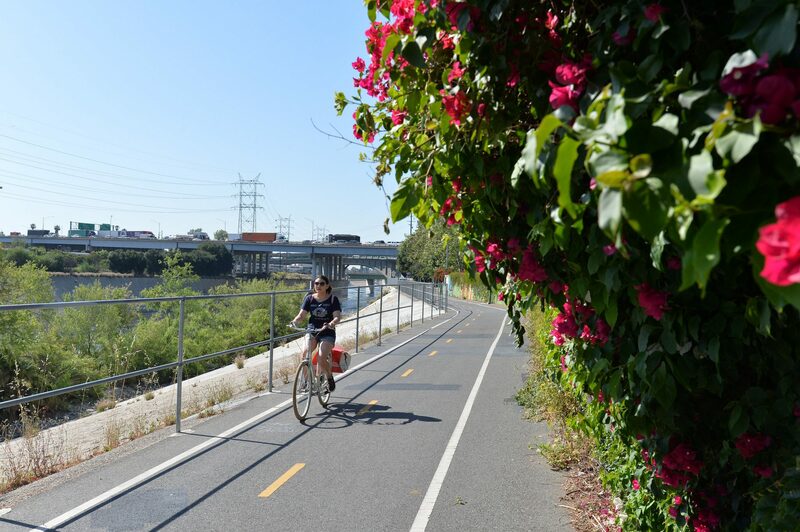 Thousands of bike commuters around L.A. County will be rolling out on May 18. 2. Free stuff. There will be pit stops across the county offering refreshments and other goodies. Check out the map below to find a pit stop near your route. FYI: the Union Station pit stop will have a DJ, a bike mechanic, and a whole host of giveaway items. 3. Free transit rides. We know it’s not always possible to bike the entire commute, so let Metro help you complete your trip. Bring your bicycle or bike helmet on Metro Bus or Rail to ride for free on May 18. To claim your free ride on Metro Rail at gated stations, use the intercom located near fare gates to notify an attendant who will open the ADA gates for you. And don’t forget, you can still sign up to get a free Metro Bike Share monthly pass. 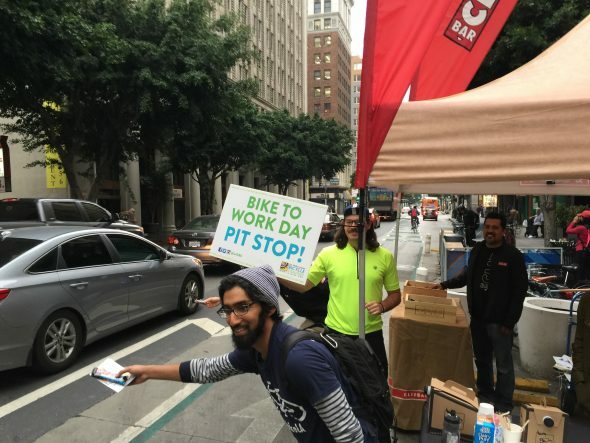 Other agencies offering free transit rides to bicyclists on Bike to Work Day include: Culver City Bus, Long Beach Transit, Norwalk Transit System, Torrance Transit, DASH and Commuter Express, Beach Cities Transit, City of El Monte Transportation, Big Blue Bus, Commerce Municipal Bus Lines and Pasadena Transit. Metrolink is offering free rides to people who board with a bicycle all week. Board trains using doors marked with yellow decals. Always walk your bike within Metro stations or on trains. Elevator priority will be given to passengers with disabilities. Observe all Bikes on Metro guidelines. If bringing your bike on a bus, try to sit or stand near the front of the bus to keep an eye on your bicycle. At your stop, notify the operator you will be removing your bike and exit from the front door. why are you mentioning inferior place that like no one (ever) talks about??? Really? OC mostly has really nice, wide roads/sidewalks & excellent bike paths. So the other 364 days is not bike to work days? Where do you live? In the arctic circle? I’m on it. I trust more people will enjoy the spirit of the event and join the movement for more biking and a multimodal environment in LA!